Much like an iceberg with just a small amount of its mass visible from the surface of an ocean, workplace injuries have expenses and ramifications far beyond the unfortunate injury that an employee experiences from a slip or fall. The prevention of injury at a company is critically important because the injury affects everyone at the business (as well as its stockholders) – not simply the injured worker. It is normally assumed that when a worker slips or falls and is injured, the costs accrued are those resulting from medical treatment, workers’ compensation, and perhaps an insurance company penalty in the form of raised premiums for the business. But what of the indirect costs of on-the-job injuries, as well as the “hidden” costs involved with workplace injuries? According to EHS Today – a media resource for safety, health and industrial hygiene professionals in the manufacturing, construction, and service sectors – U.S. companies pay $62 billion dollars per year for workplace injuries. It’s a higher figure than the gross domestic product of 91 different countries today, according to World Monetary Fund data. “’We rank the top 10 causes of the most serious, nonfatal workplace injuries by their direct costs each year to help companies improve safety, which better protects both employees and the bottom-line,’ notes Debbie Michel, general manager of Liberty Mutual’s National Insurance Casualty operation. ‘Workplace accidents impact employees’ physical, emotional and financial wellbeing. They also financially burden employers, who pay all of the medical costs related to a workplace injury, together with some portion of an injured employee’s pay. Beside these direct costs, workplace injuries also produce such indirect costs for employers as hiring temporary employees, lost productivity, quality disruptions and damage to a company’s employee engagement and external reputation.’” Read the entire EHS article. Although there are certainly more examples of hidden costs, these examples are dreadful enough for any HR manager or supervisor responsible for keeping a company operating in the black over time. Read the entire WCF page on the hidden costs of accidents. Given the profound negative impacts resulting from the direct, indirect and hidden costs of workplace mishaps, the old adage about “an ounce of prevention is worth a pound of cure” becomes trenchant and relevant for all manufacturing, transportation, and oil & gas industry-related businesses today. Check-out this free, handy Injury Cost Calculator from the Safety Management Group. Why lose time, profit, reputation, potential new clients, and the productivity of good employees? Sure-Foot’s many anti-slip productshelp avoid accidents due to slips, trips and falls – three of the Ten Most Expensive Non-Fatal Workplace Injuries. Employers need to understand the total cost of workplace injuries. 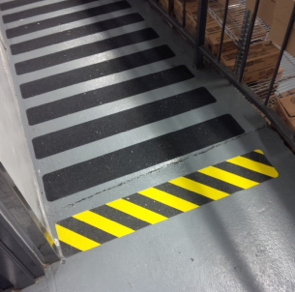 Implementing certain safety measures, such as Sure-Foot anti-slip flooring, is an investment. But the expense is nominal compared to the long-term costs and risks of workplace injuries for any company desiring success. Interested in Sure-Foot products for your business, or as a reseller? You can request a product sample.